Snowplows tend to travel at a lower rate of speed than other vehicles, so be sure slow down if you see one in front of you. The person operating the snowplow may also need to stop more frequently than other drivers to make sure that the lights on it are free from snow and ice. Do turn your lights on so that the snowplow operator can see you. You should have your headlights on even during daylight hours. If you are attempting to pass a snowplow, avoid doing so on the right-hand side. When the plow is being operated, the snow and any debris the blade picks up will be deposited on the right side. When a plow is being driven, it can create a snow cloud behind it. Drivers should avoid following the snowplow too closely, since the cloud of snow can interfere with visibility. Snowplow safety also pertains to the people who are working hard to keep roads clear in the winter. Operators should make sure they are well-rested before starting their shift. Wearing clothing that is appropriate for the weather is also important. An operator should dress in layers so that he or she can stay comfortable in the cab and when stepping outside the vehicle. While it may be tempting to rush through the plowing process to get the job done and get home, it's more important to drive at an appropriate rate of speed and get the road cleared safely. Slow down from time to time to allow motorists to pass the plow. Snowplow operators are subject to the same traffic laws as other motorists, so be sure to observe the local speed limits. The vehicle's seat belt should be worn at all times when operating the plow. Driving in the snow for several hours can lead to fatigue and the white landscape can have a hypnotic effect on a plow operator. Taking breaks regularly is a good strategy. Stopping the plow and getting out of the cab to get some fresh air will help the operator refocus on the work at hand. Children need to understand that snowplows are very large and that they take time to slow down and stop. However, it may be difficult for children to hear a plow approaching, and they should move well back from the road if they see or hear one. Playing near roadways is not the safest choice in the winter. Children can fall onto the roadway in the path of an approaching snowplow, and the results can be tragic. Building snow forts near the street is also unsafe. A plow operator will have difficulty seeing children if they are hidden from view while playing behind or under a pile of snow. 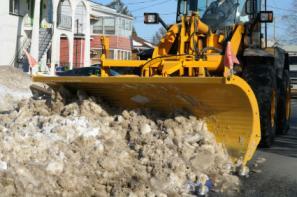 Snowplow safety is something that everyone who is on or near roadways should be aware of. The operators are performing a necessary function, and if they are able to focus on their work without distractions the process will run smoothly.